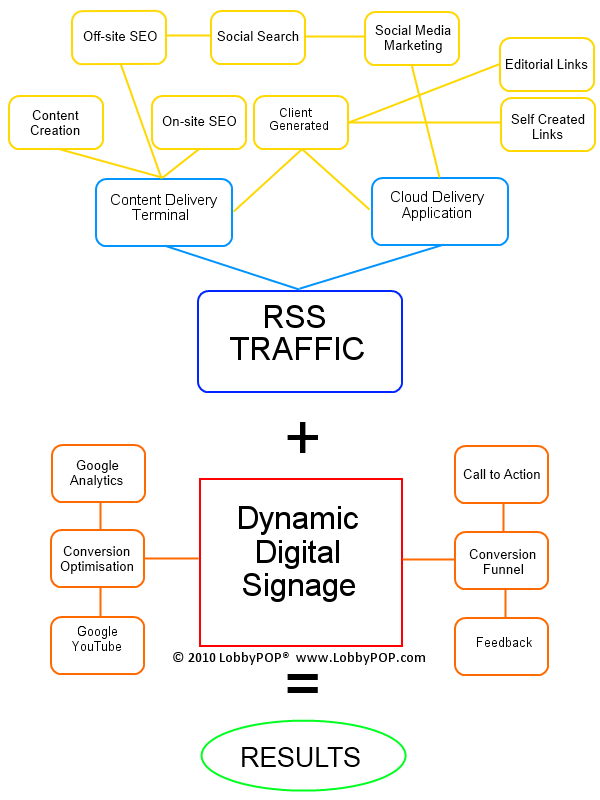 Back in 2007, one of our blog posts predicted that the “traditional” sign industry trade associations would be looking at dynamic digital signage as the new frontier. That, we can now boast, is a prediction fulfilled. See our July post of 2007 for the exact prediction for the International Sign Association’s involvement to come. That day has come! Enter the massive base of static sign and digital graphics providers. It is telling that both the Screen Graphics Industry Association (SGIA) and International Sign Association (ISA) have dramatically increased their focus on digital signage in their respective October and April Las Vegas conferences. How about another prediction – one so important we built our entire LobbyPOP premise upon it. We began our foray into electronic digital signage in 2006 after extensive research, specifically choosing an “Edutainment” format for our own specialized content. LobbyPOP content is very recognizable, and always provides engaging graphics, quality video, voiceover and music to present interesting and important facts about a particular industry’s products and services. We dubbed this “edutainment” as a reflection of the education and entertainment value encompassed in quality content. Now, without blowing our own horn too much, this year in March, Digital Signage Today featured an article which touted a “new” concept, “Infomercials coming to digital out of home.” Wow- the sound of thunderous applause here at LobbyPOP headquarters! In a move that in hindsight seems incredibly obvious, advertising technology firm rVue has partnered with a direct response TV firm to bring direct response ads to the digital signage networks using rVue’s Demand Side Platform. Yes, it seems incredibly obvious to us! “It is a very exciting time, and we’re really working hard on bringing forward some what-we-believe-to-be-very-important initiatives and solutions for our space,” rVue founder and CEO Jason Kates said in a recent phone interview. As anyone who follows our blog knows, we squirm when the words “important” “initiatives” “solutions” and “our space” are all in the same sentence. “We must be one of the last media in the world who haven’t had this developed as a full-blown opportunity for us,” Kates said. We see Google, Social Media, and Microsoft all becoming critical to the digital media platform. What we see also is the confusion this creates in the marketplace, as clients and media providers try to sort out what is relevant and important. Of course, we have some thoughts on these subjects. You’ll have to read our next posts to learn more… Remember our motto: A Step Ahead… is a Great Place to Lead! Okay! How to Create LG EZSign Templates! Enter your email address to follow this blog and receive notifications of new posts by email. We won't share your email!